In my office there hangs on the wall two framed icons of Jesus and a Christus Victor Cross. The two icons pictured feature a fairly stoic and clean Jesus. 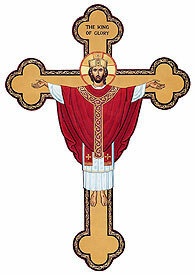 On the Cross hangs a Jesus with an emotionless face wearing a crown as well as a chasuble and stole. The Jesus of these pieces of art as well as the Jesus of so many pieces of art from paintings to stained class windows doesn’t seem all too human. If anything he appears to be more divine than human. If anything his divinity outweighs his humanity. Is this the Jesus of the Gospels or is this the Jesus of our own projections and perceptions? In the Gospels Jesus refers to himself as “the Son of Man” or more succinctly put “the Human One” or “the Human Being”. And appropriately so. When we pay very close attention to the Gospel accounts Jesus does not simply come across as some other-worldly being but rather as a human being. He gets angry (Mark 1:43-44, 3:5; John 2:13:22), frustrated (Mark 9:19) and saddened (John 11:33-35). He is rude (Luke 19:1-5), harsh (Mark 8:33) and provocative (Mark 3:1-6; John 5:1-17). And he almost has an anxiety attack (Mark 14:33-36;Luke 22:44). He’s not always humble, meek and mild. He is the Son of Man. He is the Human Being. In fact, he is quite human. Next Post Do We Know Why We Do What We Do?